I understand from memory that the RECFE was a training vessel. She is seen here in Tilbury Docks. Your memory serves you correctly, Jack. This small vessel was in Tilbury for a short while readying itself for a 10-week “epic” voyage to Australia in 2004. 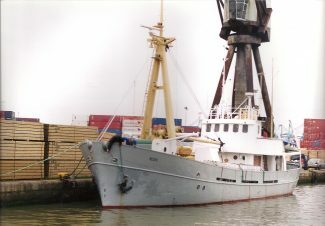 Built in Norway in 1954, the 120-grt RECIFE (note spelling), started life as the cargo vessel RUNDOY, and spent many years trading cargo into the Norwegian fjords. Towards the end of its Norwegian career, it was used by the Norwegian coastguard under the name KYSTVERN, and its cargo hold was converted into a classroom for training purposes. In 2004, it went off to Sydney at an average speed of 8 knots, and is still there, apparently used as a training ship, but it is up for sale and the asking price is AU $499,000. When it was at Tilbury, it was then owned by an Australian training organisation, but I have not yet determined the name of the outfit.